Sonnax now offers two high strength input housing and shaft kits which are the perfect solution for upgrading standard strength 4L60E inputs shafts for use in High Performance and Heavy Duty applications. Both kits utilize an OEM High Strength "reluctor" style input shaft and come with a reinforcement sleeve on the aluminum housing, to strengthen the aluminum splines which are otherwise prone to cracking. Additionally, each kit includes a reworked OEM aluminum overrun clutch piston and seal. 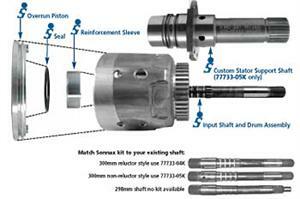 The 77733-04K kit is a direct upgrade for '04 Up applications with an existing "reluctor" style shaft. The 77733-05K kit includes the same components as the "reluctor" style kit plus a custom pump-stator shaft, fitted with a closely toleranced Teflon???? lined rear bushing, to adapt the "reluctor" style shaft into "non-reluctor" applications. Neither of these kits will work with earlier 298mm style input shafts that have a pilot journal on the end of the shaft. 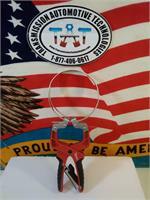 **Note: These kits must be used with an aluminum forward clutch piston. Sonnax 77764-01 aluminum billet forward clutch piston or an OEM aluminum forward clutch piston are the only options that will function correctly with these kits.